The greatest skydivers in the world are at your doorstep. Ready to hold your hand as you take that climactic step into a realm of speed, space and freedom. We can teach you to skydive solo, but our innovative programs are made to teach you how to be safe, effective and the best skydiver in any jump load. With the right training and some determination, you will earn your certification at Skydive Georgia and become a USPA licensed skydiver with the ability to jump anywhere in the US. 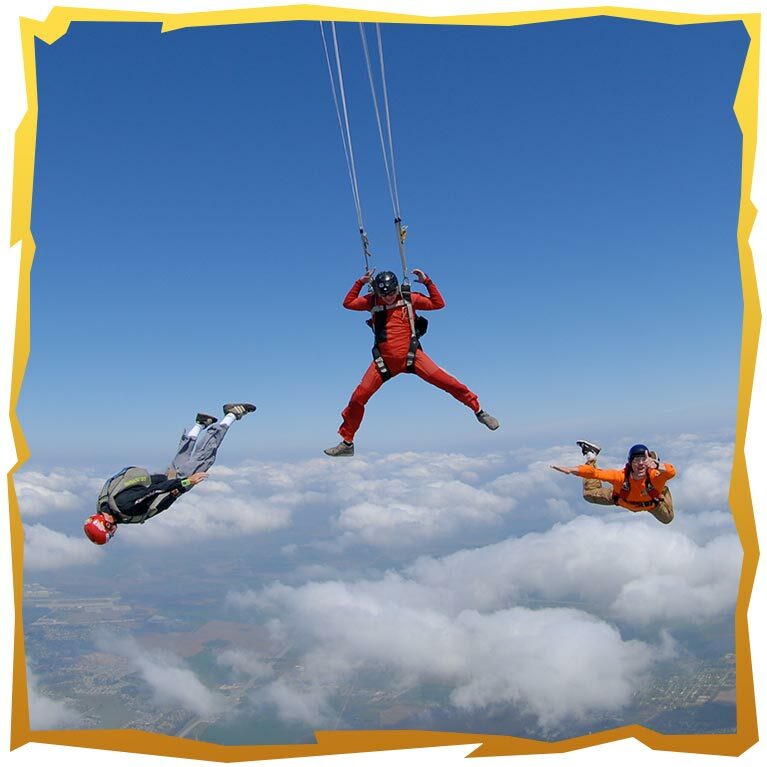 Accelerated Freefall (AFF) is a training program for skydivers who lack experience, but are determined to become a ‘skydiver’ in a short time. The program is appropriately coined ‘accelerated’ given its expedited nature as compared to slower courses like RAPS. Skydive Georgia’s program, built on the base of the USPA’s safety-directed Integrated Student Program (ISP), is fun but extensive to guarantee each trainee is prepared to carry out each jump with proficiency. Students will be trained individually or in small groups to ensure the acquisition of materials and procedures. The AFF course is no piece of cake, yet anyone can pass it given enough resources, commitment and love for the sport. With that said, the program runs smooth when a student attempts to complete the course within a few days to a few weeks. Considerably long recesses can hinder a student’s performance, advancement in the course, and can incur additional training and jump costs. While this is not always true and some students complete the course without fault over a few months’ time, large breaks can put a trainee in a less than advantageous position. Skydive Georgia’s original program will provide you with the skills needed to skydive competently through seven levels of achievement (A-G). Each level consists of ground training and a jump. Each jump getting progressively more advanced while the training beforehand lessens as you acquire the basic skills needed to build your experience as a skydiver. The first seven levels will count as jumps toward the ultimate goal of receiving your A-License after 25 jumps. Assuming your success in the AFF program, you will be cleared to solo under student status until you can complete the 17 additional jumps, guided, but not directly assisted, by instructors, practicing the skills you have learned and more advanced techniques before receiving your A-License.Skydive Georgia offers a course for the full 25 jumps called the A-License Package, which includes the entire AFF course, 25 jumps total, coach jumps, all gear rental, and five minutes in the wind tunnel at iFly Atlanta. 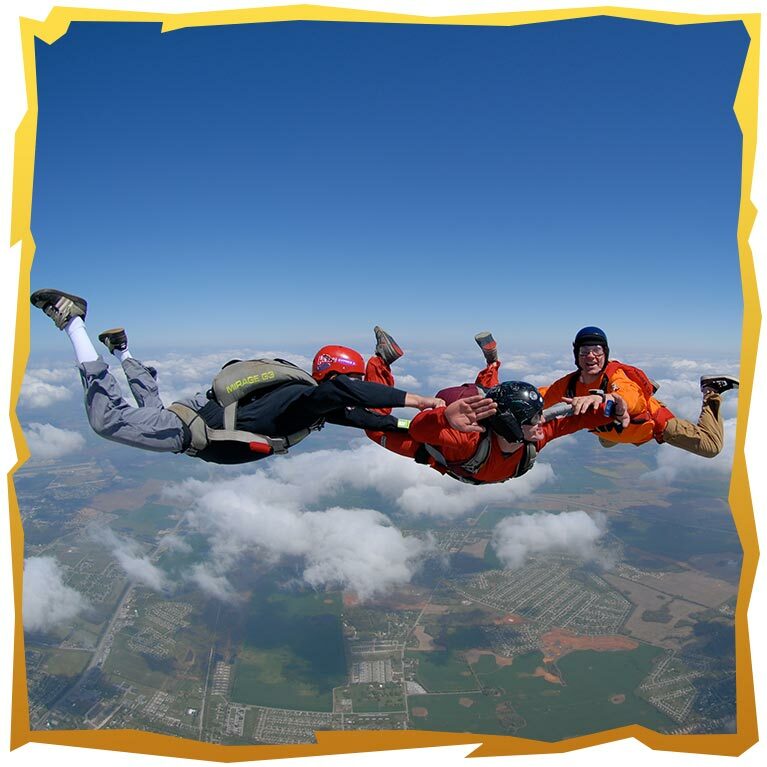 Here at Skydive Georgia, we live, as skydivers, for the thrill of the wind rapidly rushing past as we fall towards earth, and the relaxation of coasting through air currents under the canopy. We live on the edge, though not in danger – amidst the elements, but not at their mercy.